Product prices and availability are accurate as of 2019-04-22 20:43:37 EDT and are subject to change. Any price and availability information displayed on http://www.amazon.com/ at the time of purchase will apply to the purchase of this product. 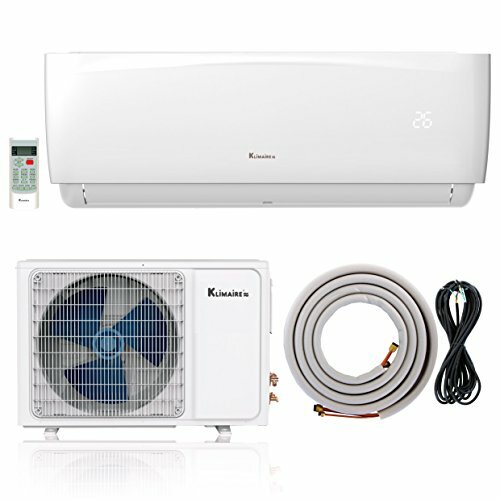 New KSIA Ductless Mini-Split AC Heat Pump Delivers Comfort To Your Exact Specifications New for 2016, Klimaire has launched the KSIA Series of ductless mini split air conditioner heat pumps. Stand out features include comfort modes like "Feeling" and turbo, along with energy efficient DC inverter technology. With the Feeling function activated, the temperature sensor moves from the wall unit to the remote control. For the ultimate in precision comfort, the sensor directs the mini split to adjust heating and cooling based on the temperature immediately surrounding anyone carrying the remote. DC inverter system saves energy and keeps temperature steady Full-function LED remote control Turbo mode cools or warms up the room fast KSIA's indoor unit is wall mounted and includes an easy-access washable filter and easy-wipe front panel. The matching outdoor unit combines heat pump and inverter technology for high efficiency cooling and 8.4 HSPF (11.26 COP) for heating. KSIA| Indoor Unit Zone heating and cooling makes temperature control both smart and simple. Using programmable features and timer functions standard on the KSIA series, easily customize the temperature in each room. Set the unit to preheat or pre-cool the room according to your schedule. It's hassle-free and will eliminate the need for higher energy draws required for fast heating or cooling. And because no one's life runs perfectly on time, turbo function is a built-in feature that will quickly get the room to your ideal temperature whenever you desire. You'll feel better knowing the KSIA Series from Klimaire always has your back with foolproof functions like auto-restart and anti-cold air. Dry mode saves energy and keeps indoor moisture levels in check Never lose your settings with auto restart memory Full-function LED remote control KSIA | Outdoor Unit DC inverter technology maximizes energy savings and minimizes temperature fluctuations.